Seasons Change Everything in Forza Horizon 4. It’s the catchphrase that was used on several occasions by developers Turn 10 Studios and Playground Games leading up to the release of the game on October 2nd. Since then, Forza Horizon 4’s weekly seasonal changes have introduced new content, features and experiences for players to discover. From new events to fresh cars and challenges, drivers always have something new to find on a weekly basis in beautiful, historic Britain. 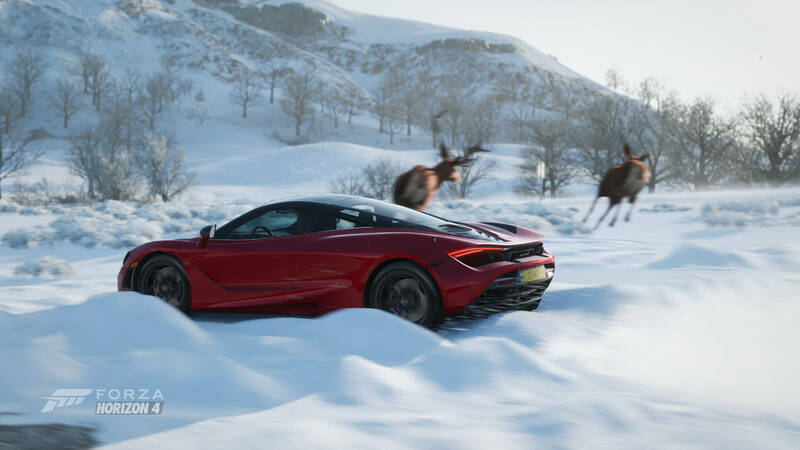 For the record, the seasonal change in Forza Horizon 4 occurs every Thursday at 2:30pm GMT. That’s 9:30am EST and 6:30am PST. This week Britain has turned into a Winter Wonderland. Snow and ice cover the roads and forests, whilst the trees become barren and completely shred of their leaves. It means darker evenings, but a mythical glow from the moon as the end of the year approaches. The huge Derwent Water has also frozen over into an ice lake to deliver some slippery fun in Britain. This is the ultimate White Christmas in Forza Horizon 4 – and it looks beautiful, delivering the most unique and striking conditions of any of the four seasons in the game. The next stage of the Horizon Racing Cup has officially begun. 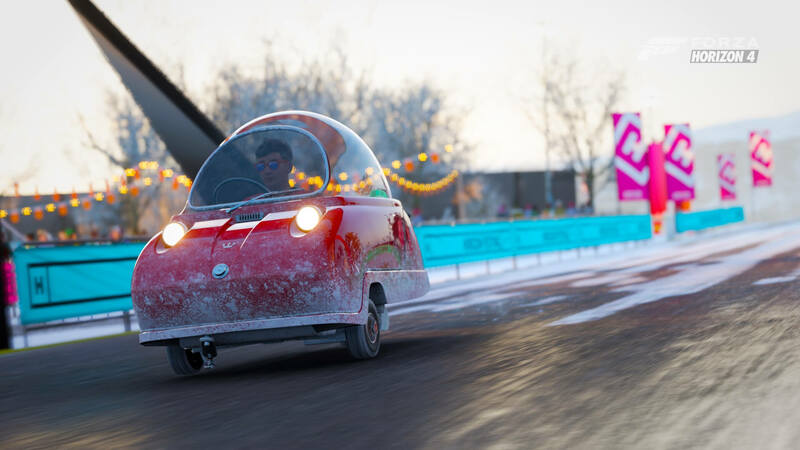 Introduced with the Series 3 November Update for Forza Horizon 4, the Horizon Racing Cup challenges players to win 12 Seasonal Championships with a prize pool of up to 3.6 million credits. Drivers are tasked to carefully choose and upgrade or downgrade their car to meet the required PI restriction set by each individual championship. The Horizon Racing Cup allows you to compete against other real-world players or AI Drivatars, but you’ll need to strategize beforehand by tuning your ride and being skilled enough if you wish to perform efficiently and walk away with the big prize pot at the end of the cup. 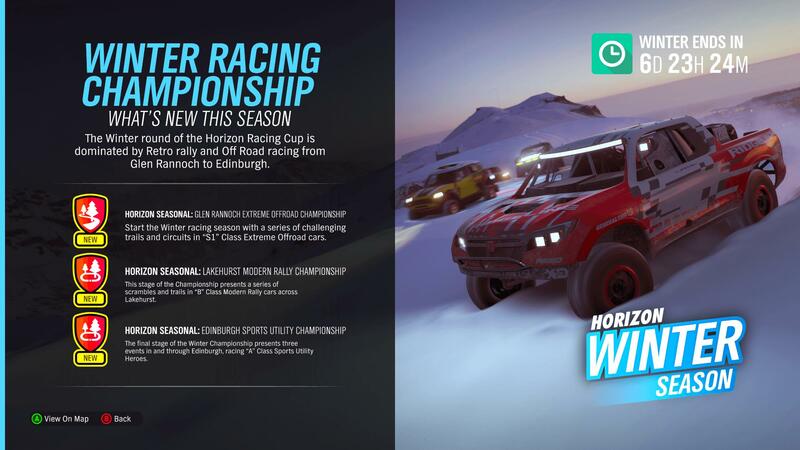 The Winter Edition of the Horizon Racing Cup features the Glen Rannoch Extreme Offroad Racing Championship in cars tuned to S1 Class, the Lakehurst Forest Modern Rally Championship in B Class cars, and finally, the Edinburgh Sports Utility Championship in the Scottish capital uses A Class SUVs. This week’s Forzathon event will see you getting behind-the-wheel of a Rally Monster in Forza Horizon 4. It could so well be the all-new Gymkhana 10 Ford Focus RS RX available this week on the Forzathon Shop or even the older Gymkhana 9 model. Outside of Hoonigan, you can also take out the 2017 Ford GRC Fiesta or the 2017 Volkswagen Rallycross Beetle. Whichever one you do choose, be ready to take it out onto into the dirt across Horizon Britain’s off-road racing trails. Firstly, you’ll need to keep its throttle pinned through the corners at high speed to pull off 20 Ultimate Drift or E-Drift Skills, before putting the car to its paces to earn a total of 15 stars from Speed Zones. Lastly, you’ll relive the brutal power and speed of a Rally Monster by winning 3 Dirt Racing Series events located around the Horizon Festival. Complete the weekly Forzathon event and you’ll earn yourself 100 Forzathon Points – or double if you own the Forza Horizon 4 VIP Membership or the Lake Lodge home. Weekly Forzathon events always centre around a specific car type, model or manufacturer, and allow you to try out the diverse roster of the more than 450 Forzavista cars available in the game. 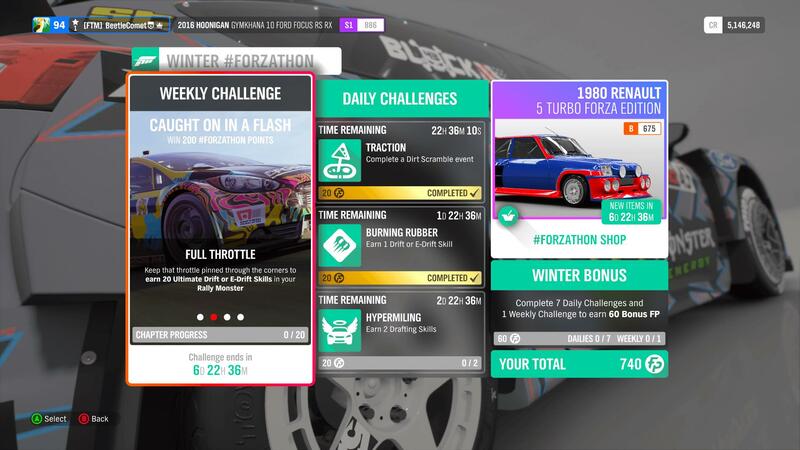 Additional Forzathon Points can be earned by completing daily challenges and participating in the shared Forzathon Live events, which occur every hour in the shared world. Forzathon Points can be spent in the Forzathon Shop, which offers a rotating stock of rare cars, clothing items and wheelspins. 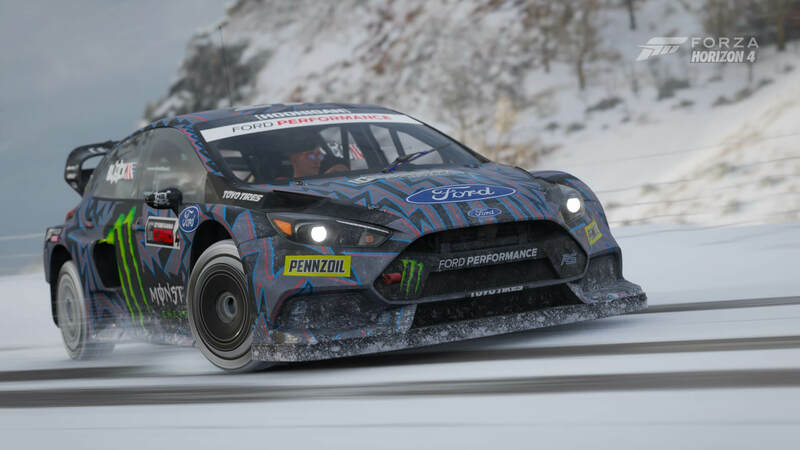 Every week, the Forzathon Shop replenishes its stock of exclusive cars and clothing items, and this week is no different with the arrival of an all-new exclusive car – the 2016 Ford Focus RS RX, one of the all-new Hoonigan rides driven by pro rallycross driver Ken Block in his action-driven, stunt-filled Gymkhana 10 film. 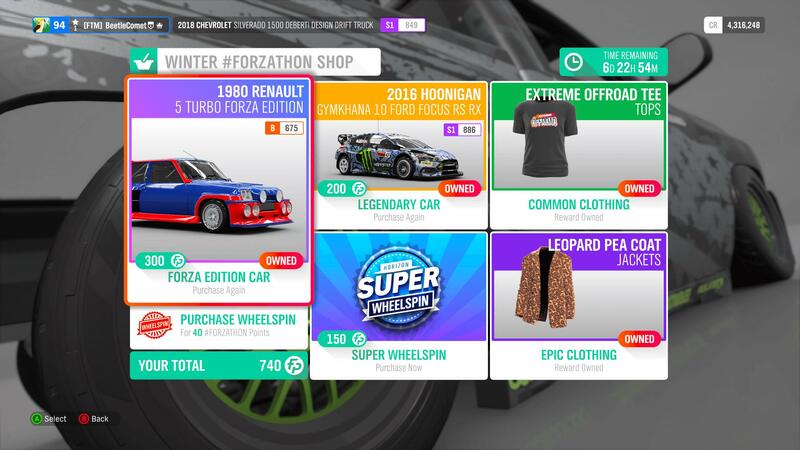 In addition to the Gymkhana 10 Ford Focus RS RX, the Forzathon Shop is also offering a new Forza Edition car for sale in the 1980 Renault 5 Turbo, whilst the elusive Leopard Pea Coat jacket is also available to acquire, alongside the Extreme Off-road Tee. These are accompanied by the usual Wheelspin and Super Wheelspin offerings, should you wish to test your luck in the hopes of winning some exciting new wheels, clothes or credit bonuses in exchange for those elusive Forzathon Points. 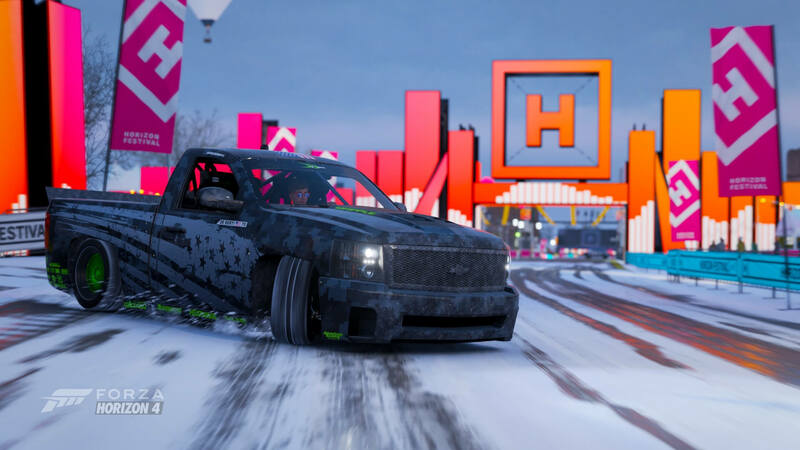 Forza Horizon 4 expands its offering of small, quirky cars and drift trucks with the latest batch of rides available for Car Pass holders. For those unaware, the Forza Horizon 4 Car Pass introduces two new cars every week for players to drive across beautiful, historic Britain – an initiative that lasts for a period of 21 weeks to deliver a total of 42 brand-new cars into the game. This week’s Car Pass additions include a small, but lovable British classic in the 1965 Peel Trident, which is complemented by a custom-designed vehicle from DeBerti Design in the 2018 Chevrolet Silverado 1500 Drift Truck. These rides are available to add to your Forza Horizon 4 garage today at no additional cost if you own the Car Pass, included in the Forza Horizon 4 Deluxe Edition and Ultimate Edition. The Forza Horizon 4 Car Pass can also be acquired separately and is discounted for Xbox Game Pass subscribers. Winter is now available in Forza Horizon 4 until Thursday, December 13th, which is when we’ll see beautiful, historic Britain transform once more as Spring arrives and the flowers and trees blossom. Spring will bring a fresh, reborn atmosphere into Horizon Britain alongside the fourth and final round of the current Horizon Racing Cup series, with more events and challenges to complete, as well as new cars to collect and race. 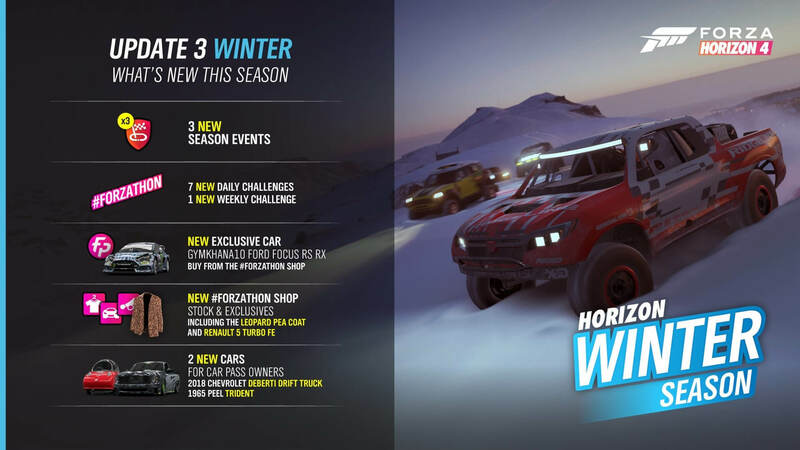 The next seasonal change will also be accompanied by the arrival of the first Forza Horizon 4 expansion – Fortune Island. Set in the in the remote northern reaches of the British Isles, the Fortune Island expansion introduces epic new driving experiences with extreme conditions, including ravines, perilous cliffside roads, and the longest section of paved mountain switchbacks ever built for a Forza Horizon game. It also features the same four seasons as mainland Britain, allowing for even more diverse weather conditions and terrain in what is being dubbed as the most extreme and dangerous location yet of the Horizon Festival. Experience it on Thursday, December 13th at no additional cost with the Forza Horizon 4 Ultimate Edition or the Forza Horizon 4 Expansion Pass. Before we wrap up, the Winter Barn Find can also be located over the next seven days in Horizon Britain should you have missed it before – and this one is found on an island in the middle of the frozen-over Derwent Water. You can see why it’s exclusive to this time of year. Find it and you’ll unlock a classic British automobile in the 1970 Range Rover, which will be repaired and added to your Forza Horizon 4 garage once its ready. Forza Horizon 4 is available on Xbox One and Windows 10 PC, as well as the Xbox Game Pass subscription service. 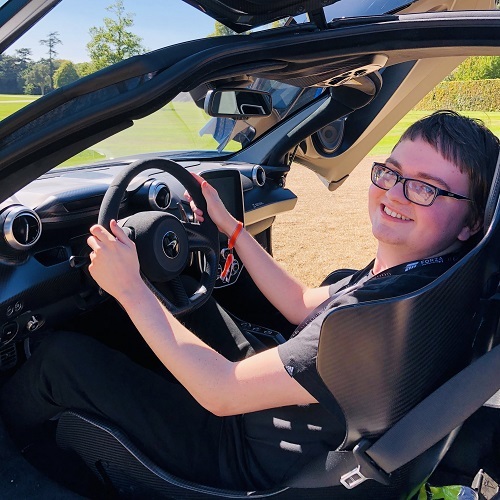 Be sure to check out our interviews with Creative Director Ralph Fulton and Xbox Games Marketing boss Aaron Greenberg, in which we discuss Forza Horizon 4’s extensive post-launch support and its incredible launch celebration event at the tranquil grounds of the Goodwood Estate in beautiful Britain. Haven’t played Forza Horizon 4 yet? Then be sure to read our in-depth review for everything you need to know on Playground’s unmissable shared open-world racing game.